This weekend we were celebrating good things. I wore this Saturday night to dinner celebrating five years --- five years ago we got married on a beach in Riviera Maya Mexico. Sigh. We went to a local Italian restaurant for dinner, and then we may or may not have smashed some Cold Stone Creamery afterwards. I chose this outfit because I felt the dress was perfectly romantic feeling for the occasion. I was really excited to feel the temps drop about 20 degrees since Friday, so this blazer was a perfect cover up! In other news - my sister had the baby this weekend! Meet Jonathan James, born Saturday, September 6 at 2:52pm pacific time, 8lbs 2oz and 20" long. She was admitted Friday night and IV induced. So basically, I was checking my phone late Friday night up until he was born Saturday afternoon. I love technology because my mom was in the room with her and my brother in law the whole time texting me and my brother with updates along the way. And I was able to send my sister a sappy "wish I was there" video before the real work began. So excited! I get to meet him in person later this month!! Hope you all had a great first weekend in September also! 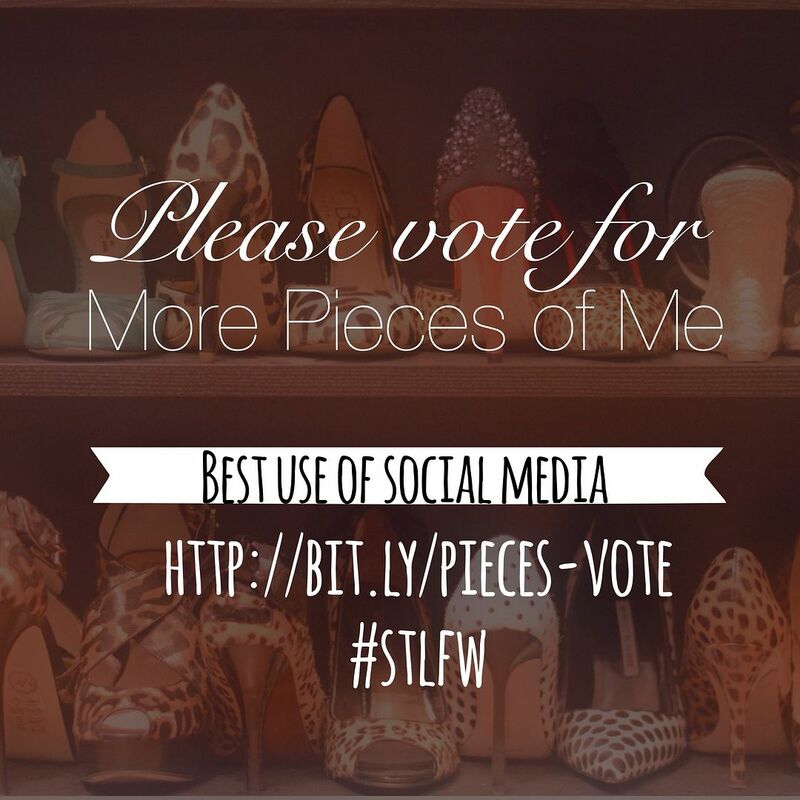 Just a reminder about my St. Louis Fashion Blog award nomination! Thank you to everyone that has voted and continues to vote! You can vote once a day per email here (category #6). If I win, you guys have to pick something I should do for you as a thank you for the support! Linking up for Style to Inspire, Rachelle and Cha Cha for #HowIFall. 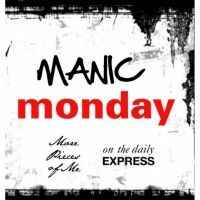 We'd love to have YOU link-up with us for Manic Monday. 1. Click below to add a link to your recent post. Any topic is fine! 2. Please make sure your post has links back to both More Pieces of Me and On the Daily Express. 3. It would be very cool if you followed along with us via the social media platform of your choice (Instagram, Bloglovin, Pinterest, Twitter etc. ), but as long you link back to the hosts it's all good. Oh congratulations!!! On both counts, 5 yrs is fantastic and an Aunty is so wonderful!!!! I hope your sister is doing well and bub is perfect! I love your outfit and girl you have so many shoes!! I have serious shoe envy. When I was pregnant with my little girl Zara I e bayed all of my heels!!! I know shock horror, the only heels I kept were my Manolo's and my wedding shoes! but that's it, I had a out of body experience during pregnancy... it happens! Happy anniversary and congratulations on being an aunt! Fabulous things to celebrate! Beautiful feminine outfit! So pretty! Thank you so much! I appreciate it - and thanks for the validation on this dress! What a cute little dress and it is girly and feminine perfect for an anniversary celebration. So happy for your sis woot woot! Thanks so much! It was awesome following along the action via text! Now I just need to meet the little guy already!! Congrats on your anniversary and you new addition to the family. Your dress is just lovely and I love the necklace!!! Congrats on your 5 year wedding anniversary!! You looked gorgeous! Your nephew is adorable, congrats on the new addition to the family! Thanks for the voting reminder - I just did it :) Love the anniversary dress! It's perfect for the occasion and just right for late summer/almost fall. CONGRATS on the new nephew!! Yayyy!!!! So exciting and I can't wait for you to meet him! For several reasons!! I know!!! I'm so psyched! Eeeee!!!! And thanks for affirming my dress decision. I was going to save it for a wedding, but it was almost not dressy enough. I loved it for a date night tho! What a fun dress! Congrats on 5 years and the new nephew! How exciting! So many great things indeed Carylee.....Best wishes to your 5th and that bundle of joy! And can't take my eyes off those killer shoes!!! Aren't they yum? I just love them. Love the boho vibe of your dress! Such a chic look with the blazer and those amazing shoes! You look adorable! Congrats on your anniversary and your new nephew! Thanks so much! I cell across the most perfect Free People pieces every once in awhile like this! I love it! And super excited to spoil the nephew! Sounds like the perfect weekend! Happy anniversary and congrats on the new baby in the family! I love your dress. The detailing looks beautiful. Thanks! It was definitely an exciting weekend! And the dress is a lot of fun! Congratulations Auntie and congrats on 5 years! Sounds like it was a beautiful weekend! I love this dress/blazer combo and those heels are killer! I would love to live in your shoe closet! 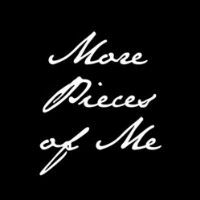 You have one amazing collection from what I have seen here! Great post! So cute and congratulations to your sister!! Thanks so much!! We are all so excited! Thank you, Cynthia, it really was! Oh, yes, the wedding was great- wish we were there now! Those shoes are killer! And congrats on your sweet little nephew! I love this dress on you! The colour looks amazing on you, especially with those shoes! Thank you! I had trouble picking shoes for this dress, but figured these "grounded" the look nicely. Happy Annivesary!!! I love this look- it is romantic! We celebrate 13 years today! Tonight is just a simple night at home and this weekend we planned a little getaway which I can't wait for! Yay!! Happy anniversary to you also! Sounds like you have great things in store as well! Have fun! Sounds like you had a great weekend! So much good events going on! I know! Thank you - it was great! 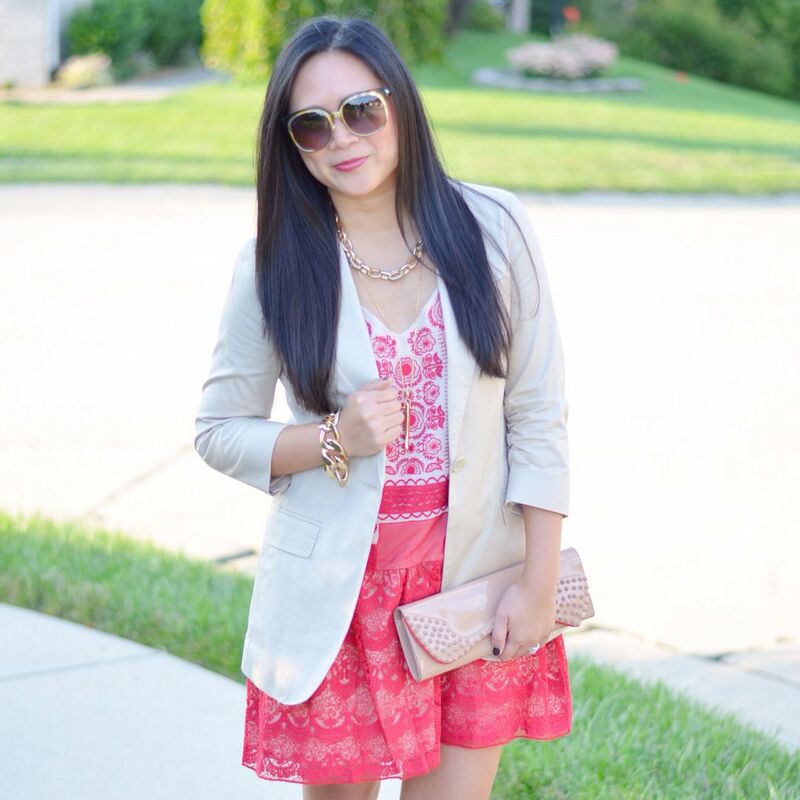 Love how your outfit goes from pink to mulberry at the bottom -- a great trick for transitioning to fall! I love the way you phrased that! Thanks! Pretty dress and congratulations on the new addition! Thank you and thank you! I appreciate it! 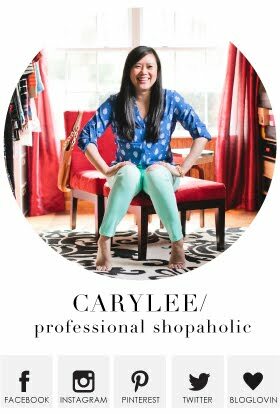 Congratulations Caryle! I also voted for you :) Good luck!!! Thank you!! And thanks for the vote! Awww congrats on 5 years! And congrats to your sister too! You look so feminine and pretty in this outfit. The shoes are stunning, and I love the color and fit of your blazer. Thanks, Noelle! This blazer has been around forever - I'm glad I've held onto it! Congrats on your anniversary and you becoming an auntie, both of which are great occasions to celebrate. I love your look today, that dress is so cute and feminine and I love the blazer over it. You look fab! First of all congrats to your sister. Her baby boy is beautiful, auntie. Secondly, happy 5 years to you guys! That's amazing. You look beautiful. I own that same Blazer. 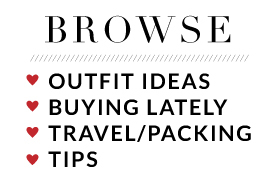 Looks like I should try it with a Fit+Flare Girly Dress. Love the mixing of Masculine with Feminine. Those Shoes are gorgeous and totally on trend for Fall, especially since one of the colors is Sangria (pretty much Oxblood, but they renamed it two years later lol). Always a pleasure linking up with you two fashionista ladies. P.S. Did I miss somewhere that you were from St. Louis? Seriously. Stupid me. ha! I guess I don't really talk too much about being in St. Louis, outside my love for Cardinals baseball, so I don't blame you for missing it! And thanks so much for the sweet note. It was quite the happy weekend! hahaha! The mental pictures that gave me are awesome!! Thanks so much for this note, lady! You always make me smile! Congrats on your nephew and your anniversary! Love these heels! Thanks so much! They're one of my fave pairs for sure! Thank you so much! It's all pretty exciting!! Your clutch is faaaaabulous!! :) Thanks for hosting the link-up every week! Thank you!! And we appreciate you stopping by! Happy Anniversary!! This is such a great outfit to celebrate in. And congrats on the new addition to the family! Such a cute look! That clutch is amazing! Congrats on your anniversary and for that precious niece you have! Thank you! I had been coveting this clutch forever before I finally just decided to take the plunge! It was such a great sale find! Thank you! I have them in 3 colors because I love them so much!! Congrats on the addition to your sister (and your family)! The baby looks adorable and so cute! Also, I love your hair straightened like that! Looks very nice and sleek! Aww - thank you! I feel like straight is my least fave way to style it because it just hangs there kind of lifeless, so this comments means a lot! I`m here first time and I think you have a great blog! and pics so inspiring!!!! great job! So i wanna to ask you how about follow each other? I always follow back so let me know and we can keep in touch, will be great :) I love to know a new people! What a beautiful gorgeous dress! Perfect for a romantic dinner with hubby celebrating your 5 years of marriage. Congratulations! My BFF just visited Maya Riviera and the photos were awesome, Im pretty sure too your wedding was a fantastic one too. Congratulations for being an Auntie. 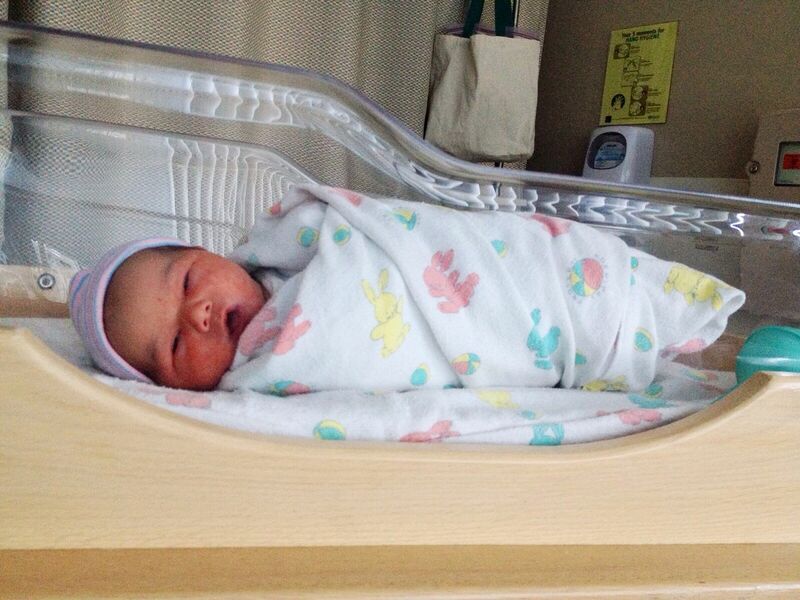 Your nephew is adorable, I would also guess your sister gave birth at Kaiser because of the trademark baby wrap. Have a fantastic week ahead and thank you for hosting the linkup, so glad I made it! Thanks so much for the note! We love Riviera Maya - so beautiful, especially for the price! We've been half a dozen times now! Thanks for linking up! Adorable! Congrats on 5 years and on being an Auntie!!! Congratulations!!! You look gorgeous in that darling dress! I love all the details and the heels to chose to style it with. …and congratulations to your sister as well. That baby is just so precious!